Mr Smith Casino is no longer available . Click here for alternative casinos . With a superior blend of state of the art games, large bonuses and enticing jackpots, Mr Smith Casino is the UK online casino of choice. Since their upgrade in 2014, Mr Smith Casino has maintained their focus of being the grandest British online casino, and provider of the most entertaining and exciting casino games. Players are amply rewarded whilst playing exhilarating games in a safe and reliable setting. Mr Smith Casino, formerly known as Harry casino, launched in 2014 and is licensed by the lotteries and gaming authority of Malta. 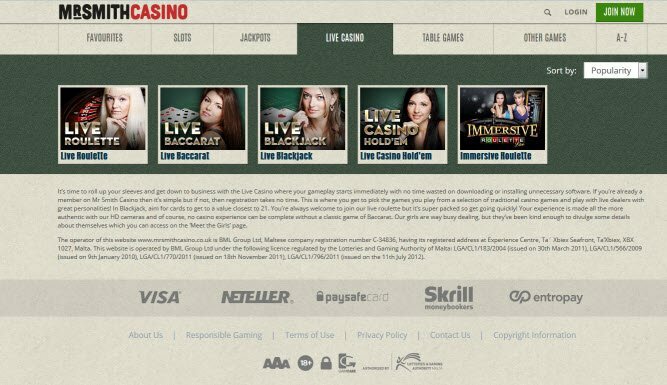 Harry Casino was originally established in November 2011 under the Betsson group. Since then Mr Smith Casino has launched themselves as a new and improved casino. They have taken all the excellent features that Harry Casino had to offer and combined them with enhanced features in order to provide the superior Mr Smith online casino. With a website only in English, Mr Smith Casino focuses on the British market, positioning themselves at the top of the hierarchy of the list of UK online casinos. Marketing themselves as the new “top dog in town”, they make it clear that they have set some stiff competition for the rest of the online casinos. Throughout the website you will see the very posh Mr Smith “top dog”, this bulldog is very cute and really gives character to the website. He is kitted out in a very cute outfit and as a fan of dogs you can’t help but believe what this one has to say about the online gaming experience at Mr Smith Casino. Players can make themselves comfortable in the luxury of their own home and be delighted to know that Mr Smith casino games will ensure their every desire is catered for. 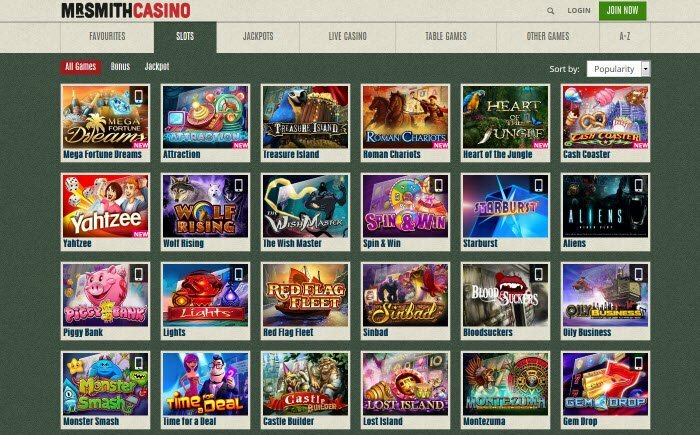 Players can enjoy a live casino option and a mobile casino option. At this casino one can find a wide range of over 350 games to select from, such as classic online casino games, video slots, video poker, black jack, Texas hold’em, baccarat and more. The focus is not only limited to the quantity of games but also to the quality of games provided. With the list of Mr Smith casino software providers including NetEnt, Microgaming, GTS, Playtech, Cryptologic,Quickfire, evolution gaming and more, players can expect a real quality experience, whilst playing a variety of innovative games. The full welcome package offers players £300 in bonuses and 300 free spins. Players can enjoy unlimited free play on Mr Smith casino games and they can win some money on the variety of casino games. They can also try their luck at the Jackpot games on offer. Certain games have significant jackpot prizes associated with them and of course these continue to get larger and larger as international players bet on them. Mr Smith casino games that offer jackpots are Vault Assault, Mega Joker and Gold Rush. 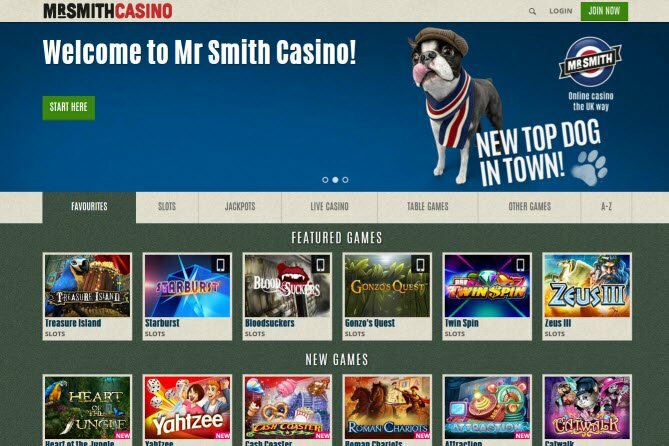 Players will not be required to spend any time downloading Mr Smith Casino software, there is a live casino open to players to enjoy games such as live roulette and live blackjack. Simply sign up, which is a speedy process and you are on the path to begin playing. This experience is one that cannot be faulted, with the live HD camera the experience feels so real, and allows players to chat to the dealers at the same time. As is expected from any leading casino, the welcome package at Mr Smith casino is one that sets them apart from the rest. The full welcome package offers players £300 in bonuses and 300 free spins. The package is divided into three deposits, players can receive a 100% deposit bonus up to £100 and receive 100 free spins on their first deposit. In addition to this Mr Smith casino promotions are a regular calendar occurrence and they promise thrilling rewards. Customers can expect to be informed of these promotions by email or via newsletter. Mr Smith Casino banking accepts all major and minor payment methods, assisting players in making their transactions as quickly and smoothly as possible. These methods include Visa, Neteller, Skrill (Moneybookers), Click2pay e-wallets, as well as the prepaid cards such as Ukash and paysafecard. The Customer support team is available via phone or live chat from 9am-midnight 7 days a week and via email 24/7. The casino promises to assist with any customer queries as quickly and efficiently as possible. For those that already had accounts at Harry casino, you can expect to see all the best offerings that Harry casino had and more, and your existing account at Harry casino means that you will be able to login just the same at Mr Smith casino. If you are a new player this casino has all the features worth checking out. I much prefer the name ‘Mr Smith Casino’, also have to say that I really appreciated the wide selection of games that I had to choose from, when playing at this casino. I used to play Harry Casino before it became Mr Smith. I have to say I love the new site even more. They have a great selection of jackpots. I’ve won quite a bit of money playing their slots. I’ve been meaning to try out some of the table games. Haven’t gotten around to it yet. I love this casino, they offer a huge selection of games and I think their website has a great look and feel. In general I have only good things to say about Mr Smith Casino. Although, I was a bit disappointed by the fact that the 100 free spins that are awarded in the welcome bonus, can only be used in the Starburst slot. I personally am not crazy about this slot.